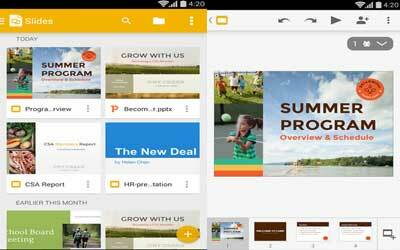 If you are familiar with Microsoft power point presentation, you will be able to operate Google Slides APK version 1.6.273.10.30 without any trouble at all. Both of them has similar interface. It comes along with Google Docs and Google Sheets. Since Google Inc is the developer of this app, you can synchronize it with other application manufactured by Google such as Gmail or Google Drive. This useful application is available under productivity section. In-app purchases are not available for it. Therefore, you will be able to enjoy any feature without having to pay. It is recommended for smartphone user who wants to create group project or business presentation. Moreover, it has several useful features that will help you to create presentation slide easily with your smartphone. Besides creating a new file, the app will allow you to edit power point presentation that is already created in the computer beforehand. You can read the file in your smartphone after transfering it on your device storage. The interface of this app provides several abilities such as arranging slides or object in the slide. Additionally, you do not have to tap on save icon every time since it automatically saves your progress as you type. The best thing to mention about this application is that you do not need internet connection. You can create and edit power point file offline. Therefore, you can finish your project anywhere and anytime. As it goes with Microsoft power point software on your computer, this application also comes with plenty template that you can choose. With the template provided and your creativity, you will be able to create interesting slide in no time. Generally, Google Slides for Android is manufactured as a solution for user who wants to create and edit power point file without accessing a computer.